The Tissot Indicatrix is a valuable tool for showing the distortions caused by map projections. It is essentially a series of imaginary polygons that represent perfect circles of equal area on a 3D globe. 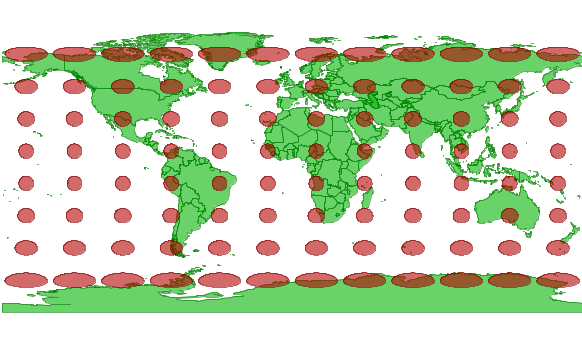 When projected onto a 2D map, their shape, size and/or angles will be distorted accordingly allowing you to quickly assess the projection's accuracy for a given part of the globe. Note that the angles are perfectly preserved (the trademark feature of the Mercator projection) but the size is badly distorted. Now lets try Lambert Azimuthal Equal Area (in this case the US National Atlas standard projection - EPSG code 2163). OK, now for the geeky part. Here's the python/OGR script used to create the tissot shapefile. 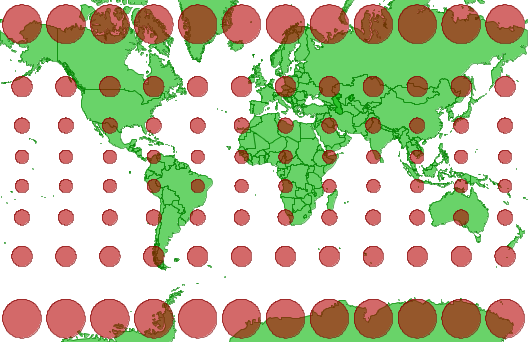 The basic process is to lay out a grid of points across the globe in latlong, loop through the points and reproject each one to an orthographic projection centered directly on the point, buffer it, then reproject to latlong. 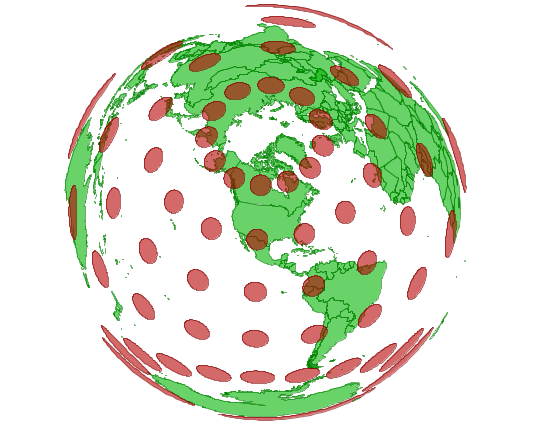 The end result is a latlong shapefile representing circles of equal area on a globe. # but will appear distorted in ANY 2d projection.